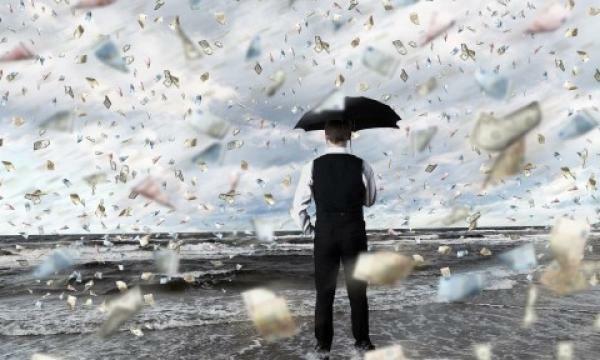 Is Singapore heading for technical recession? SGD policy adjustment is also a key issue. Singapore's manufacturing contraction continues to deepen with industrial production contracting a sharper-than-expected 7.9% yoy in December, while November and October readings were revised lower. This brings the 4Q to -6.6%, worse than implied (-6%) in flash GDP estimates. Adding to the pain is the latest report by the Ministry of Manpower showing total employment growth at its lowest since 2003. Here’s analysts outlook on the future of Singapore economy this year. They also shared their view on whether another monetary policy easing is warranted or not. 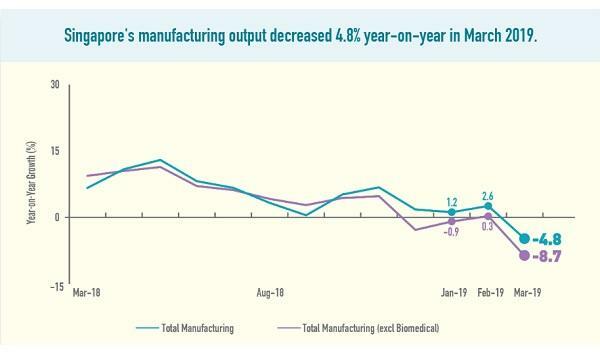 Singapore's manufacturing contraction continues to deepen. Industrial production contracted a sharper-than-expected 7.9% yoy in December, while November and October readings were revised lower. This brings the 4Q to -6.6%, worse than implied (- 6%) in flash GDP estimates. • Negative: We expect 4QGDP growth to revised down a notch to +1.8% yoy (+4.9% qoq saar), from MTI's flash estimate of +2% yoy (+5.7% qoq saar). Our base case is for the MAS to maintain its current 'mild' modest and gradual S$NEER appreciation stance this April. But we are increasingly concerned that services growth may not hold up in the face of an intensifying manufacturing recession. We now see nonnegligible risk of a technical recession. Singapore's considerable exposure to the Chinese economy will weigh on its growth prospects over the next two years, and we have downgraded the citystate's real GDP growth forecast for 2016 and 2017 to 1.9% and 2.2%, respectively. Meanwhile, the Singapore dollar will remain under pressure as the Chinese yuan depreciates and the MAS looks to ease its currency policy in April, taking the unit to SGD1.4800/USD by the end of 2016. 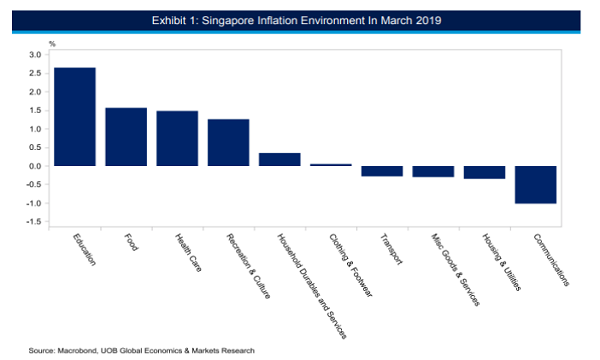 Given Singapore's significant exposure to global trade activity, as well as its deep links with the Chinese economy, we believe that the city-state faces an increasingly difficult economic outlook over the near-to-medium term. While China's economy expanded at a pace of 6.9% in 2015 according to official statistics, it is our assertion that the actual rate of growth is considerably lower than this. Having become Singapore's single largest national export destination over recent years, China's slowdown will act as a disproportionately large drag on Singapore's growth prospects, and we have downgraded the latter's real GDP growth forecast to 1.9% in result (from 2.3% previously). At the same time, the weakening of the Chinese yuan will take its toll on the Singapore dollar, and we have incrementally downgraded our end-2016 forecast on the unit to SGD1.5000/USD, from SGD1.4800/USD previously. Despite the slowed employment growth due to the global economic outlook, we remain optimistic as the Ministry of Manpower Labour Market Advance Release statistics do not point to any clear signs of recession. A primary indicator of this is that unemployment has continued to remain low and stable. In addition, median income rose sharply for Singaporeans in 2015, by 7% in real terms, showcasing employer confidence in the market as well as a growing understanding around the importance of offering higher salaries as part of their talent retention strategy. Total employment growth, whilst at its lowest since 2003, is no longer fluctuating strongly. With Q4 2015 numbers higher that of Q3, we expect to see that growth will now stabilise and continued at a moderate pace in 2016, barring unexpected issues or crises. We do not expect local employment to stay flat for an extended period of time as local employees upskill to fill the current skills gap, and fresh graduates with sought-after specialist skills enter the workforce. Our recent 2016 Market Outlooks highlighted that IT talent such as cloud specialists, cybersecurity experts, as well as engineers, developers and designers with solid mobile experience, are currently lacking in the market.